Instant coffee. It’s not a retro cool comeback: it’s reborn, with all the nuance and flavor of specialty coffee first in mind. When we first became aware of the magic being worked at Lancaster, Pennsylvania’s Swift Cup, we were curious. When we tasted their instant coffee, we were blown away. Through Swift Cup’s advanced technology, they’re able to turn beautiful brewed coffees into incredible instants—something we were thrilled to be able to offer the busy fans of Joe Coffee. We sat down with Swift Cup founder Nate Kaiser to go a little more in-depth. Until very recently, when people thought of instant coffee, something very low-quality came to mind. What made your partners think you could flip the script on instant? You’re absolutely right and we shared those feelings about instant coffee for sure. For us, we were very curious as to why the quality of all instant coffee on the market was so poor. We spent time understanding the production process for commodity instant coffee, the stuff that you find on the shelves of most supermarkets, and realized that every part of the production was designed for quantity over quality. The coffee going into instant is literally the lowest of the low grade and the manufacturing practices are harsh, stripping all nuance from the coffee. We wondered what would happen if we created a manufacturing process focused on quality and then build efficiencies in from there. Would that create good instant coffee? Spoiler: Yes, it certainly does! What’s evolved in instant technology that made Swift Cup’s partners think “this is our moment”? First, instant coffee will never be better than the roasted coffee going into the process. The quality of coffee we have available as consumers is on a whole different playing field than when the first instant coffee factories were created, nearly 80 years ago. Specific to Swift Cup, we developed a piece of hardware that allows us to brew coffee with careful precision and in a highly concentrated manner. From there we developed a recipe using freeze-drying technology that gently dehydrates the coffee, preserving the nuance and character we celebrate in Specialty Coffee. This moment is unique and really a culmination of everything that’s been taking place in Specialty Coffee for decades. Progressive farming and processing practices, roasting is better than ever, highly focused coffee brewing and a rapidly expanding customer base who expects higher quality coffee on all fronts. And when that quality isn’t available when you’re stuck at the office or traveling, Swift Cup offers those standards, but in instant form. How did you connect with Joe Coffee? When Jonathan and the team came down to Lancaster, we quickly learned we shared common values. 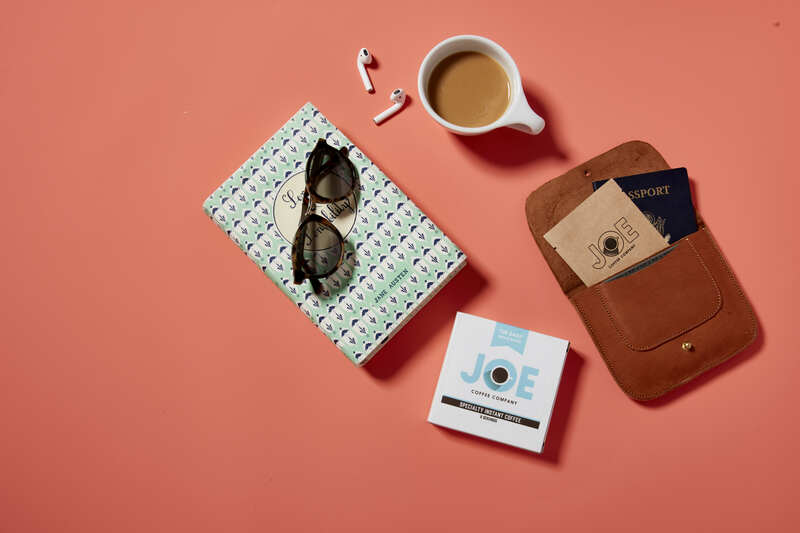 We did sample runs of Joe coffees in instant form, and the team at Joe was stoked on the quality. We then spent time together developing the product, with a shared mission to make quality coffee more accessible. For us, partnering withJoe, a trusted roaster with a major retail footprint, has played an integral part of introducing specialty instant coffee to the market. The Swift Cup instant product ends up being quite versatile, easy to dissolve in hot water, cold water, milk, or even seltzer. What are your favorite interesting ways to prepare instant coffee—have you done anything particularly novel with it? Initially, we were stoked that our instant coffee produced a good cup of black coffee ha! We didn’t expect there to be so many fun applications. Stirred into ice cream is definitely a favorite! Shaken with chocolate milk or even dissolved into tonic water, both delicious. I think to date, one of the most exciting things we’ve done with it is dissolve it into beer. Coffee beers have traditionally been pretty predictable and one dimensional, but having a concentrated coffee powder that packs a range of flavor opens the doors for some wild experimentation! What’s next for Swift Cup? Every day we’re learning new things about our process, ever refining and looking for innovative ways to make our instant coffee better and better. We’re growing quickly, but our focus remains quality first. With the help of such dedicated partners like Joe, we’re eager to bring specialty instant coffee to more and more people! Interested in trying it yourself?